Always takes a while to get going again after the excess of Christmas, although most of the excess is in miles rather than calories. The Pirie’s were in Scotland and Cumbria again and feel like I need a holiday after the drive. We had the larder wall cabinets to complete and the sink wall units, which includes the lit shelves behind. 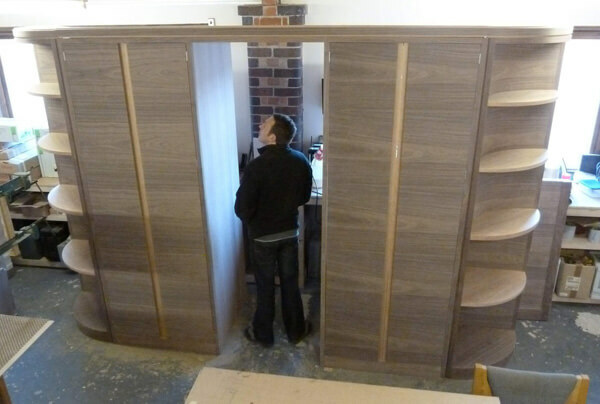 We finally put the larder run together last week to check out what it was going to look like, and we liked the look! It is big as John clearly shows by standing in the centre, and in case you are wondering the bit in the middle has the wine fridge in with bottle racks above. Our new project management systems have worked well. On a 620 hour estimated make we were only 7 hours out. We struggled to bring the timings and costing under control on some of the earlier big interior projects, but that’s because there is a lot of detailed design work going on in our kitchens. Every piece in every kitchen has a twist which elevates it well beyond even some ‘famous’ and supposedly ‘bespoke’ big brands I could mention. 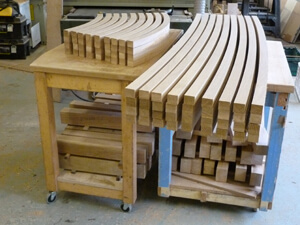 We have also been cracking on with the Tudor Arcade seating, converting our little oak mountain into components. Pretty cold out there to be cutting timber though! What we are all really loving about this job is the mix of hi-tech and lo-tech solutions: steam bending and getting elements CNC cut – that’s a computer controlled router that works straight off the computer designed drawings (CAD) put simply. It does some up our pragmatic approach to furniture making, but nevertheless it is unusual to be able to utilise both techniques in one job. We use a CNC machine just up the road from us at another furniture makers called Marcus White. Marcus embraced this technology early on and uses it very successfully in his own work. It has been mostly large manufacturers that use CNC, but it is increasingly finding its way into smaller more specialised designer-maker type workshops. It really comes into its own on curved complicated shapes that traditionally you would need to make shaping jigs for and run past the spindle moulder. In the case of the Tudor Arcade benches there are 16 shaped slats each with two faces. That would be 32 enormous jigs with very subtle radius changes – dull and time consuming to make. At the other extreme is the steam bending. This very ancient means of bending wood is not a simple option, it is an inexact art-form but also a science. It does have a great deal of integrity from a visual and structural perspective and it is also very physical! We have to make big former jigs to bend the 2 inch oak to shape around. On the Tudor benches the back rests, outer and inner frames all need bending. There are 6 different bends across 24 components. 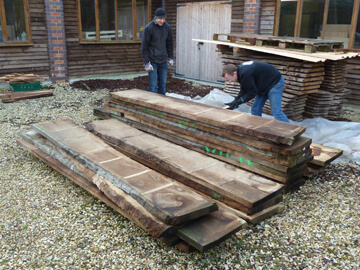 The timber is steamed for 2 hours making it malleable . It is taken out and put quickly into the steel strap. A scaffold bar is needed to leaver the cam down over the jig. Wedges are hammered into place to lock the bent wood in place. Done. It then sits in the former mould for 24 hours before being released. Invariably it does ‘spring back’ a bit and part of the art is experimenting to know how much there will be for each bend. Perhaps counter-intuitively the tight curves hold their form best. 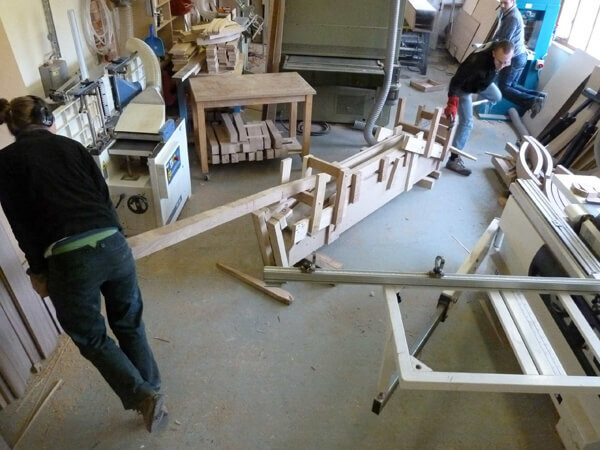 This image is of the last bend we did for the 3 seater bench element. We needed Alice and John on end levers on this one. Mike was strap man, I just do the photos!